Do you have an engaging story of backcountry adventure to tell? Perhaps you’re halfway through writing a reflective memoir that is sure to become a bestseller? Are you friends with any writers who are currently looking for a publisher for their harrowing story of wilderness survival? If so, now is your chance! 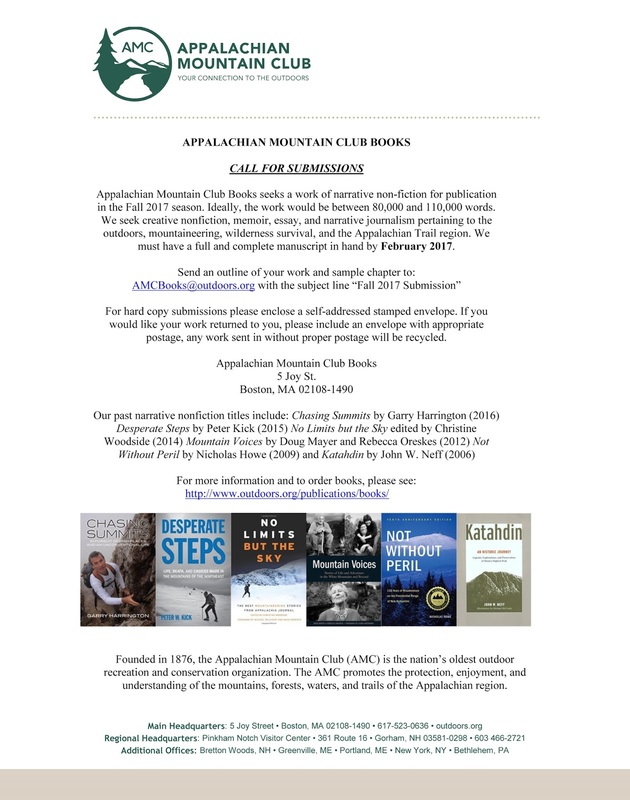 The AMC Books Team seeks submissions for a work of narrative non-fiction for publication in the Fall 2017 season. We publish creative nonfiction, memoir, essay, and narrative journalism pertaining to the outdoors, mountaineering, wilderness survival, and the Appalachian Trail region. We must have a full and complete manuscript in hand by February 2017. Please see the below flyer for more information. If you or anyone you know is interested in submitting their work for consideration, please be sure to send email to the AMCbooks@outdoors.org email address with the subject line “Fall 2017 Submission” - thanks!